Spicy food lovers will definitely love what RBG Bar & Grill at Park Inn by Radisson Davao has prepared for the spicy foodies out there. 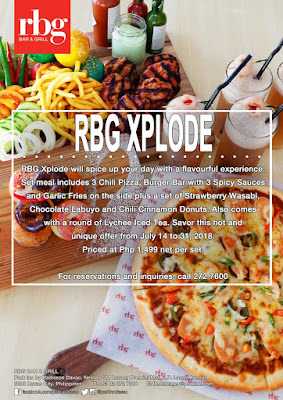 The RBG Xplode is a unique combination of flavors and now the newest set meal offer of RBG where you and your group can enjoy the play of spices of chilis, wasabi, labuyo and more. "We came up with this innovative food promotion to give our diners an exciting meal. RBG Xplode is not just about being spicy but it is more of giving spice a unique taste" Says Emelyn Rosales, Park Inn Radisson General Manager. Being able to try the RBG Xplode with the media guests and bloggers during the launch yesterday, it truly is explosive! The 3 Chili Pizza, Burger Bar with 3 Spicy Sauces and Garlic Fries. Set of Strawberry Wasabi, Chocolate Labuyo And Cinnamon Donuts. Lychee Iced Tea for a price of P1,499.00 net per set.